“Wildfire season used to be June to late September. Now it seems to be happening all year round. We need to be adapting to that,” Dr. Wayne Cascio, a U.S. Environmental Protection Agency cardiologist, said this week. “That is the big question,” said Dr. John Balmes, a University of California, San Francisco, professor of medicine who studies air pollution. “Very little is known about the long-term effects of wildfire smoke because it’s hard to study populations years after a wildfire,” Balmes said. That kind of extreme exposure doesn’t typically happen with wildfires, but experts worry about the kinds of health damage that may emerge for firefighters and residents with these blazes occurring so often. Whether that includes more cancer is unknown. “We’re concerned about that,” Balmes said. Smoke from the fire that decimated the Northern California city of Paradise darkened skies this week in San Francisco, nearly 200 miles southwest, and the air smelled “like you were camping,” said Michael Northover, a contractor. “We’re all kind of feeling it,” Northover said. The smoke was so thick in San Francisco, the skyline was barely visible from across the Bay. The city’s iconic open-air cable cars that are popular with tourists were pulled off the streets Thursday because of the bad air. 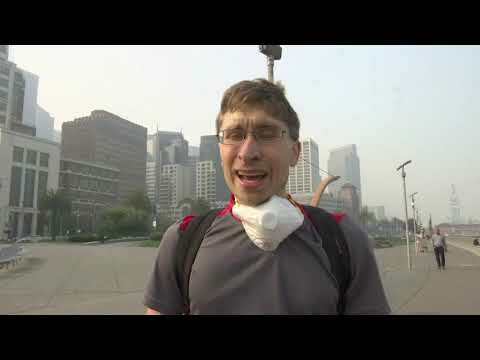 An Environmental Protection Agency website said air quality in Sacramento was “hazardous” Thursday and San Francisco’s was “very unhealthy.” Many people walking around the cities wore face masks. West returned home this week to Santa Rosa, hard hit by last year’s wine country fires, only to find it shrouded in smoke from the Paradise fire 100 miles (160 kilometers) away. West’s family had to evacuate last year for a week, but their home was spared. Smoke has been so thick in Santa Rosa that researchers postponed a door-to-door survey there for a study of health effects of last year’s fire. “We didn’t feel we could justify our volunteer interns going knocking on doors when all the air quality alerts were saying stay indoors,” said Irva Hertz-Picciotto, a public health researcher at the University of California, Davis. The study includes an online survey of households affected by last year’s fire, with responses from about 6,000 people so far. “Conventional thinking is that these effects related to fires are transient. It’s not entirely clear that’s the case,” Hertz-Picciotto said. Other studies have linked emotional stress in pregnant women to developmental problems in their children and “this was quite a stress,” Hertz-Picciotto said. It’s a kind of stress that many people need to prepare for as the climate warms and wildfires proliferate, she said.